How clothes can help your child learn. As an early childhood teacher, I know how crucial those first five years are. Did you know, the fastest period of brain development happens from birth to age three, by age 5 the brain is 95% of its adult size and the brain has formed 1000 trillion connections between neurons by age three. One of the best things we can do for our kids is encourage and allow them to explore, investigate and engage with their environment. That’s why The Smallest Tribe focuses on simple, easy to wear, fuss free, age appropriate clothing. There are no sewn in tags to itch, scratch and irritate your little one. The neck openings are wide enough to make dressing easy and comfortable but not so wide they are sloppy and ill fitting. 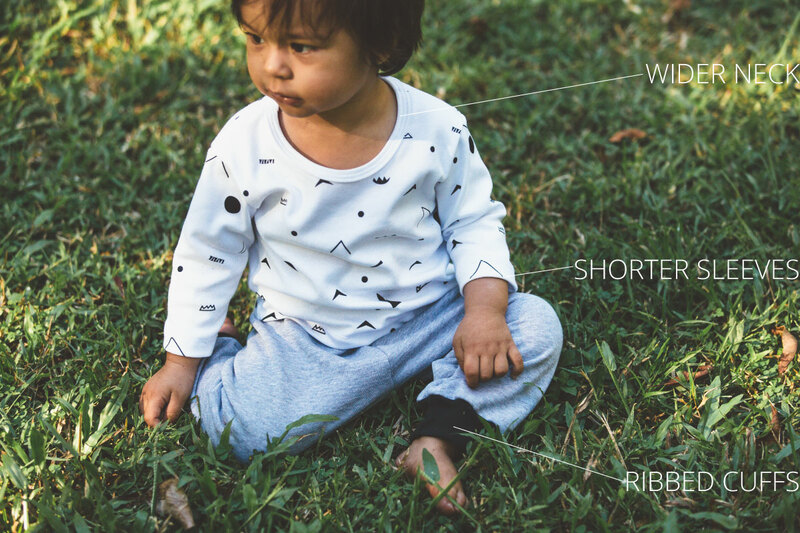 The long sleeves are cut just that tiny bit shorter so they keep your kiddo warm without hanging over their hands, getting grubby while they’re playing and wet and soggy when they’re washing their hands. The pants have ribbed cuffs that make it easy for their feet to go in but help keep the cold out. The ribbed cuffs also help keep the pants in place while they go about their busy day, crawling, learning to walk, riding their trikes, sliding down slides or climbing ladders and play equipment. You are your child’s first teacher and most important one they’ll ever have. Thankfully, they come wired and ready to learn and grow, all we have to do is sit back and let them be kids! Find the tee here, find the trackies here. Want to know more about your child’s brain development? This article will take you no more that two minutes to read and is in simple to understand language.